For its first two years, Mars, an exclusive three-day conference for some of the world’s most successful geeks run by Amazon and its founder Jeff Bezos, was largely secret. 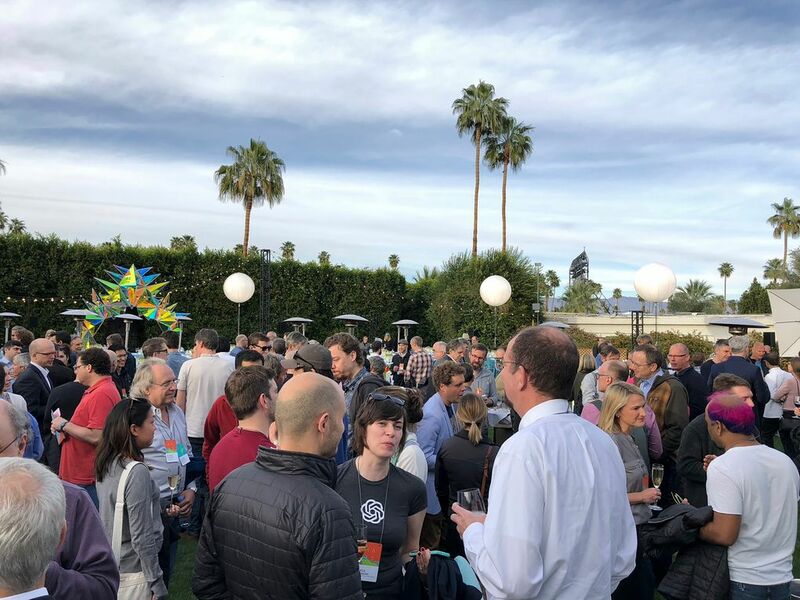 This year, Amazon lifted the veil and invited a handful of reporters into Bezos’ gathering in Palm Springs. PALM SPRINGS, Calif. — “I get invited to everything, and everywhere I go, everyone wishes they had my job. But that’s not true here,” said Pablos Holman, a self-described futurist and inventor who has worked on lasers that kill mosquitoes and machines that suppress hurricanes. 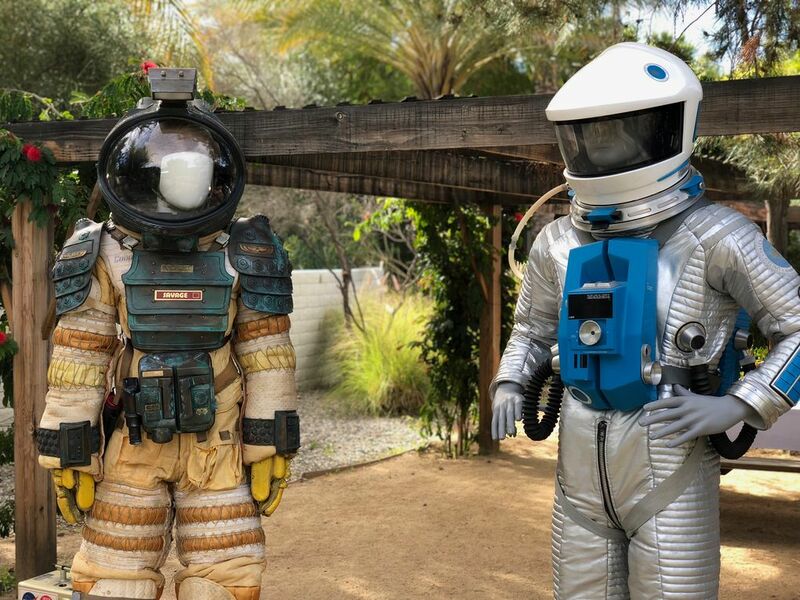 We’re at Mars, an exclusive three-day conference at a midcentury-modern hotel here in the California desert run by Amazon and its founder, Jeff Bezos, for some of the world’s most successful geeks. For its first two years, Mars was largely secret; the most prominent image that leaked was a photo of Bezos piloting a 13-foot robot last year. This year, Amazon lifted the veil and invited a handful of reporters into Bezos’ brainiac gathering. Amazon is eager to buoy its reputation in artificial intelligence, a focus of the conference, amid tight competition with Google. And Bezos, who according to Bloomberg is the world’s richest person, with a roughly $130 billion fortune, is growing more comfortable in the spotlight, particularly as a modern-day Renaissance man. His side projects now include The Washington Post, the space firm Blue Origin and a 10,000-year clock in a West Texas mountain that ticks once a year. Bezos was visible throughout, sitting front and center at presentations and posing for photos with attendees in front of a Blue Origin space capsule. His booming laugh was easy to pick out in the crowd. At dinner, seats were preassigned. After dark, free booze flowed from makeshift bars and attendees lit up high-end cigars. 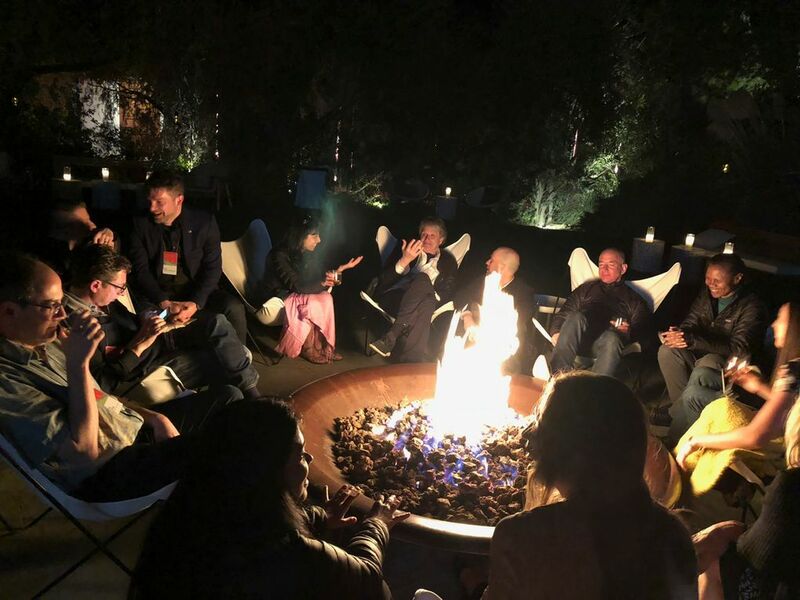 Bezos held court around the fire pit Sunday night, tumbler of whiskey in hand. 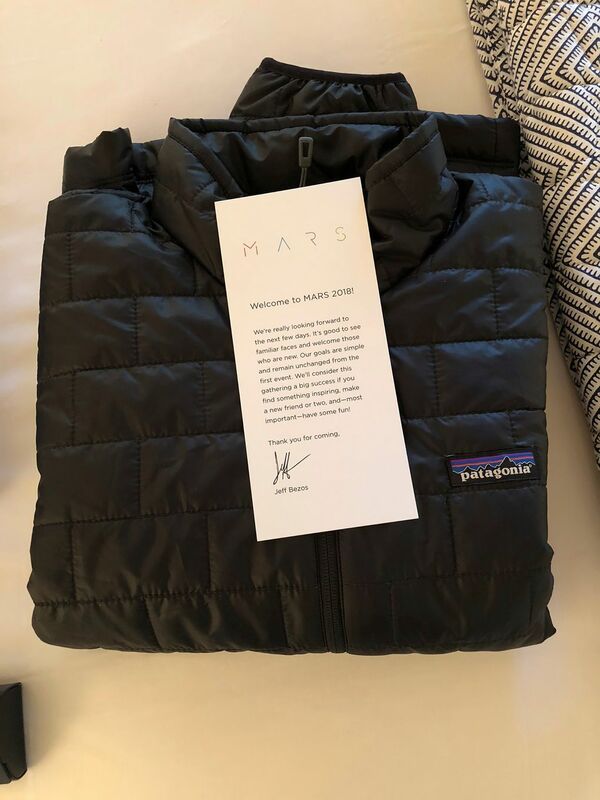 He wore the down Patagonia jacket given to each guest — a style that has become a sort of tech-industry uniform — with jeans and cowboy boots. One attendee described the get-up as Silicon Valley meets West Texas, where Blue Origin has its main launch site. Mornings were reserved for show and tell. About a dozen attendees presented on novel businesses or scientific breakthroughs, from new techniques for studying supermassive black holes to computer chips implanted in brains that can resolve symptoms of Parkinson’s disease. Rich Mahoney, head of a “powered-clothing” startup called Seismic, showed off leotards with built-in sensors and electric motors to mimic muscles — designed to help elderly or disabled wearers stand from chairs. There was one clear rock star: a yellow four-legged robot named SpotMini that strutted back and forth on stage as a sea of smartphone cameras focused in. It was the newest invention from Boston Dynamics, the Defense Department-funded firm Google recently sold to SoftBank. After the presentation, Bezos and SpotMini led the crowd to lunch. 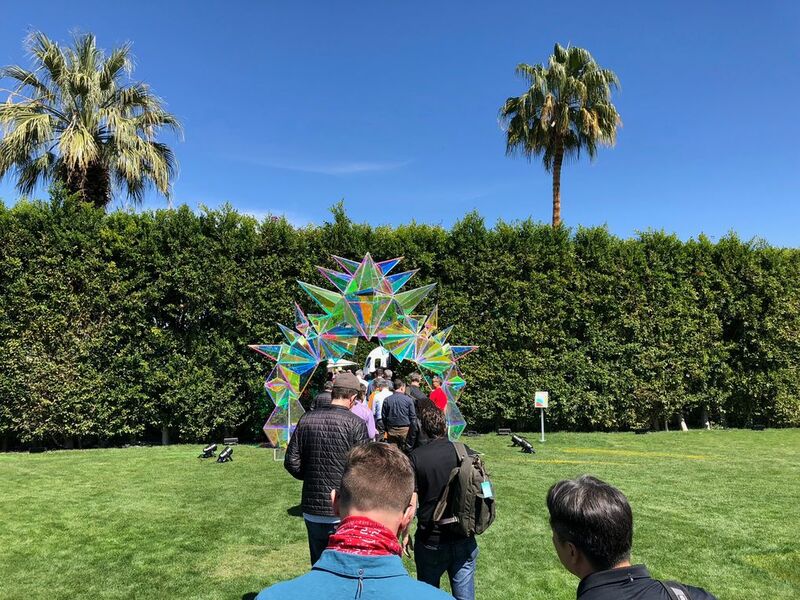 To get to lunch, attendees passed under a colorful spiked 16-foot plexiglass archway coated in a reflective dichroic film, which was originally designed to protect spacesuits from cosmic radiation — and now costs about $125 per square foot. “Four people have proposed to their girlfriends underneath it,” said Davis McCarty, the Chicago artist who built the gate in 2016 for Burning Man, the arts festival in the Nevada desert. Throughout, Amazon executives referred to repeat guests as alumni or “returning campers.” Attendees seemed universally smitten with the conference; some suggested they were a part of history. Ken Goldberg, a roboticist from the University of California, Berkeley, compared Mars to Athens 2,000 years ago, showing Raphael’s fresco “The School of Athens” during a presentation. “People would be hanging out, discussing ideas, having arguments, and a big topic at the time was space,” he said. “It’s like a true salon of its time,” said Brogan BamBrogan, an entrepreneur with a walrus mustache who now runs Arrivo, which aims to build high-speed transportation networks using levitating cars in highway medians. At lunch, Bezos played beer pong, minus the beer, against a robotic arm. (He lost.) 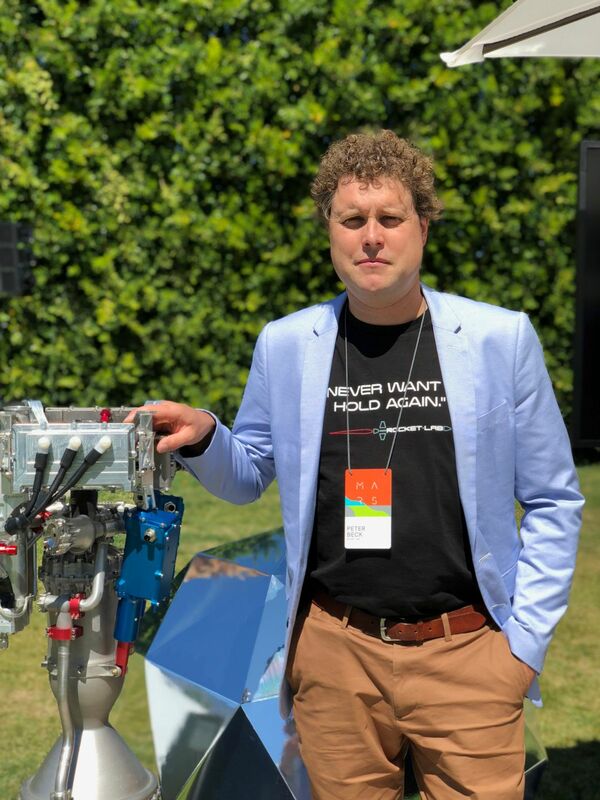 Across the lawn, attendees played a different robotic arm in table tennis, and SpotMini — piloted by a human — mugged for cameras and snatched phones with the arm that extended from its neck. In the afternoon, we had a choice of activities, from falconry to Navy SEAL training to sausage making. Group meditation was popular. On Tuesday, a collective “ohhhmmm” rang out across the hotel grounds. Eighteen of us, including me, flew aerobatic planes. Most who signed up were eager to hop into the cockpit; a few later had to use the barf bag. Many were paired up for “dogfights” in which they chased each other in the sky. We were allowed to steer the plane for periods; the pilot in back also had a hand on the controls. In one dogfight, Takeo Kanade, 72, a professor at Carnegie Mellon University and robotics pioneer, vanquished his opponent, Aaron Dollar, 40, an up-and-coming roboticist at Yale. On Tuesday at about 5:45 a.m., more than a dozen attendees gathered on one lawn and craned their necks toward the sky, looking for the Humanity Star, a satellite covered in mirrors that one of them, Peter Beck, had launched into orbit. The predawn group included Bob Smith, chief executive of Blue Origin, and Adam Savage, co-host of the former Discovery show “MythBusters.” About 90 seconds after the satellite was supposed to be glittering across the sky, nothing had appeared. Then, for a moment, there was a flash in the sky. “That was it!” someone shouted. Then another flash.